Saint Ignatius’ College is operated by an incorporated entity with a Board that is responsible for the local governance and management of the school. Saint Ignatius’ College (Adelaide) Limited (Ltd) is the legal entity that conducts the College, with which stakeholders engage, and is the employer of all of the staff at the school. JEA provides leadership to advance Catholic education in the Jesuit tradition across the Jesuit Colleges and Companion Schools. It supports and facilitates communication between these entities and with any others the Jesuit Provincial might specify. JEA has overall responsibility for ensuring that the Colleges each operate as Catholic schools in the Jesuit tradition and that they, along with the Jesuit Companion Schools, give authentic witness to the Ignatian vision in education. JEA seeks to ensure that the Jesuit Colleges and Jesuit Companions Schools are engaged in the other works of the Province, especially those that reach out to the poor and marginalised. The Chair, Deputy Chair and Directors of the Board are appointed by JEA, taking into account nominations from the Chair of the Board and/or the Provincial. JEA must ensure that there are Directors with an appropriate range of skills, experience, and expertise, including the ability to understand and competently deal with current and emerging issues in connection with Jesuit education. The Board is a non-representative body and no member of staff can become a Director of the Board. Before JEA appoints a Chair, Deputy Chair and/or a director, it must seek the prior approval of the Provincial. Directors are usually appointed for terms of three years, with the possibility of renewal. There will be a representative of JEA present at each board meeting. The JEA representative has the ability to speak at board meetings but cannot vote on any decision. This is also the case for the Principal and Rector, who report to the board and attend all its meetings, but are not members of it and do not exercise a vote. JEA approves the appointment of the Principal, the annual budget, the College’s strategic plan and master plan. JEA must seek the prior approval of the Provincial for each of these matters. The Board has responsibility for strategic direction and oversight of the Jesuit identity, education programs and financial management of the College. The Board is specifically responsible for ensuring that the school is conducted as an independent Catholic school in the Jesuit tradition, with ongoing formation. The Board guides the College’s strategic direction, developing the annual budget and the strategic plan of the College, all of which are submitted to JEA for approval. The Board also monitors and addresses the risks faced by the College. Appropriate committees exist to oversee the Audit, Finance and Risk of the College as well as the property and buildings used by the College. The Principal and Rector are responsible to the Board, the Board having delegated to them the responsibility for day-to-day leadership, management and administration of the College. The Board must assess and manage the Principal’s and Rector’s performance and offer support and advice, as it deems appropriate. The Board following approval from the Provincial and JEA appoints the Principal. The Principal is the Chief Executive Officer of the College and shares the day-to-day leadership of the College with the Rector. The Principal is responsible for the management, good order and quality of performance of the College, as well as the educational and pastoral welfare of the students and staff. The Rector is a Jesuit appointed by the Provincial. He has particular responsibility for the preservation and promotion of the Ignatian ethos and Jesuit identity of the College. He also has a special care for the faith formation of the College including the liturgical, spiritual and service life of the College as well as pastoral care of the College community. Peter Coffey is an alumnus of Saint Ignatius’ College Adelaide and in January 2018, he became the inaugural lay Principal. Peter graduated from the University of Adelaide with a Bachelor of Economics and a Diploma of Education. He has also completed a Graduate Diploma in Religious Education and is completing a Masters in Educational Studies. His early teaching career included roles at St Michael’s College, Henley Beach and a twelve-month placement at a mission school in Papua New Guinea. Peter returned to teach at Saint Ignatius’ College in 1995 and since then has served in key leadership roles. Fr Peter Hosking SJ commenced as Rector of Saint Ignatius’ College Adelaide in January 2018. He too is an old scholar of the College. Fr Hosking entered the Society of Jesus in 1975 and was ordained in 1987. He is a clinical psychologist and has extensive experience working in a variety of Jesuit ministries including Jesuit Refugee Service, Jesuit Social Services, and as part of the leadership team in the Province office. Prior to his current appointment, he was Rector at St Aloysius’ College, Milsons Point, Sydney. Saint Ignatius’ College has a Senior School (Years 7 to 12), a Junior School (Reception to Year 6) and an Ignatius Early Years centre. The Head of Senior School, the Head of Junior School and the Head of Ignatius Early Years have delegated responsibility from the Principal and Rector for the day-to-day running of their respective campuses. The College Leadership Team is the senior operational team of the College and forms strategy and manages projects aligned to the College’s mission and overall direction. 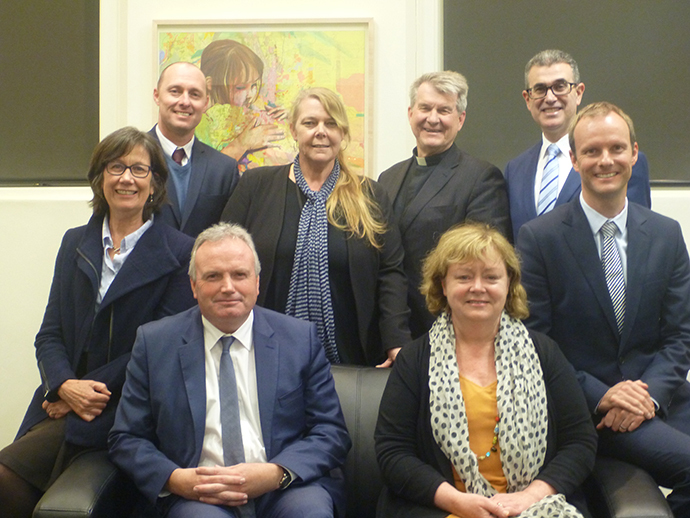 The College Leadership Team is comprised of the Principal, Rector, Head of Senior School, Head of Junior School, Head of Ignatius Early Years, Head of Business, Head of Studies and Innovation, and Head of Ignatian Ethos.